Wanna fix the world? How about Santa Fe? Or maybe you just want to get a job or start a business? Welcome to Santa Fe’s mobile party with meaning. Welcome to MIX. This month, for the first third Thursday MIX of 2010, we’re kicking off the MIX FIX by asking what’s the #%$&ing problem? 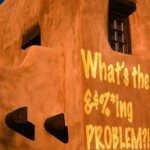 We know Santa Fe rocks because of the natural beauty, the traditional and contemporary culture, the vibrant entrepreneurial community and the high lithium content in the water, but we also know there are roadblocks to starting a business, buying a house, getting a job and having a good time. It’s time to fix it. And have a good time doing it. 99.8% of them had a great time. 75% networked with more people than just the bartenders. 60% met people providing services they needed or wanted to get involved with. 35 people ended up with contract work or solid leads on work. 2 people were given jobs on the spot. Dozens of people walked away with prizes and freebies. .02% of people meant to attend the celebrating halitosis convention and ended up at MIX by accident. They did not have a good time. …you tell us with an image, a lipstick-scrawled note, an improvised musical composition, an inscrutable glare–whatever suits your fancy as long as it’s not interpretive dance. *MIX cannot guarantee that attendees will find, be offered, or offer sexual intimacy. MIX does not necessarily condone such behavior as effective networking. MIX is not responsible for heartbreak, pregnancy, insecurity, poor decisions, regrets or unsatisfactory experiences.